Anne Hathaway and Jason Sudeikis star in Nacho Vigalondo's character-based creature feature. Spanish director Nacho Vigalondo is no stranger to readers of these pages. His previous features Timecrimes, Extraterrestrial and Open Windows have held sway over many in the genre film community. In many ways, however, Colossal is his most accomplished and, in turn, most mainstream film yet, brilliantly using an A-grade cast to tell a twist on a B-movie plot. It’s mature silliness, a dark and complex rumination on what lies at the heart of certain tropes. And it’s also a hell of a lot of fun. So while some may want to bemoan their favourite underground director inching towards the mainstream, have no fear. This is no by-the-numbers flick, but rather one that manages to surprise and entertain in equal measure. Knowing little about the narrative is certainly part of the fun, experiencing the revelations as they narratively unfold. Still, broadly, it’s a film about relationships, addictions and connections with ones past. Anne Hathaway plays Gloria, a too-hard partying girl out of work for a year who simply runs out of time with her boyfriend (Dan Stevens). Moving back home, she runs into Oscar (Jason Sudeikis), who is the local Sam Malone (the bartender from TV's Cheers), taking over his late father’s country bar and making it its own unique mishmash. Surrounded by a couple of noble patrons (Tim Blake Nelson and Austin Stowell), the film plays like a run-of-the mill coming home rom-com, with the city girl coming back and finding just how much she left behind. The way these two events intersect is the core of the film's whimsy and darkness, playing directly upon both the preposterousness and genuine grandeur of the Kaiju style. You’ve got a story with booze, heavy conversations, and titanic battles between monsters and robots, all somehow coming together in one decidedly original mix. Actually, the “somehow” in question is Vigalondo himself. His script is superbly attenuated, bouncing between the various tonalities without missing a beat. Hathaway may not be everyone’s favourite, but she has a wonderful way of being miserable or truly gutted in ways that seem to draw one in, creating instant empathy even when she’s making some pretty appalling decisions. Yet it's Jason Sudeikis who truly rises to the challenge here. A barroom discussion with one of his old friends is a critical scene, and the way that his smile and voice goes from warm joshing to intense rage is powerful stuff. Comedians often are considered to have dark sides that they’re capable of exploring, and here I was reminded of Robin Williams at his best, where someone so naturally charismatic and affable creates something downright shocking when this façade is penetrated and the darkness is exposed. In the best sense this is Vigalondo’s calling card, showing his profound ability to do genre right without ever forgetting story and character. Whether this leads to a multi-picture deal in some comic or sci-fi franchise is not for me to say, but it’s clear that here he does something rare, crafting something that feels new and fresh while still echoing the references that drive it. I love Pacific Rim, in part for its straight forward persistence and decidedly evocative visuals. This film is in some ways less epic and more ambitious, truly delving into character and using the greater metaphor of wanton destruction in a very pleasing way. 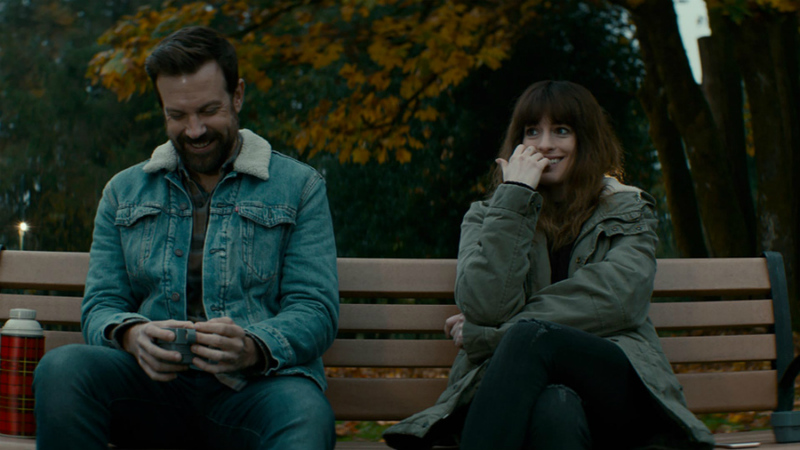 Colossal firmly establishes Nacho Vigalondo as a big-time talent, and it bodes extremely well that his continuing transition to more “mainstream” filmmaking has resulted in him losing none of his whimsy or bleakness. Hathaway’s terrific, Sudeikis a revelation, and you’ve got a bunch of comedy, drama, and monsters smashing things up. Truly a film of many moods, truly a film not to be missed. Review originally published in slightly different form during the Toronto International Film Festival in September 2016. The film will open in New York and Los Angeles on Friday, April 7, and then expand in limited engagements throughout the U.S. via Neon. I really wish we could see this gem on a big screen, but alas, it is not listed for theatrical release over here in the Netherlands. But I was a bit disappointed to see that even Imagine Festival didn't bother to select it. By the way, does anybody know what ever happened to Vigalondo's adaptation of Mark Millar's Supercrooks? They shot a very funny teaser to promote his comic-book, but beyond that I've never heard anything about it anymore.